Today I wanted to share my monthly Instagram roundup. I actually like to do these twice a month if I am able to. Its just an easy way for me to get a lot of your guys questions answered. Clearly from all of these pictures I have been loving my Schutz heels and my new AG high waisted jeans. There a few pictures with both of those items. And of course I love my Gucci belt. It really has been a good investment for me because I wear it almost everyday. It is just an easy way to make a casual outfit look and feel a little but more put together. I also just love a good t-shirt, as you can tell from the pictures. They are my favorite "mom uniform" paired with a really good pair of skinny jeans. Well that and a goof athleisure look as well. Both are my favorite for running around with the kids. Now onto a fun giveaway. Congrats Lindsaye Patterson you are the winner of the T3 Curling wand. Be sure to check your inbox for an email from me! So if you follow me on Instagram. Which I am guessing most of you do. Then you saw my story about the curling wand that I use. I have been using this curling wand for a really long time. In fact this is my second one that I have bought. Well a while back I decided to buy this T3 curing wand (pictured below) because I had heard so many great things about it. To make a long story short I din't end up liking it. I used it maybe 10 times and it has been sitting in my drawer ever since. It is basically brand new. I just didn't love the way it curled my hair for some reason and I felt like the curls did not last as long. Or maybe I am just so use to the Nume one that I have been using forever. Either way today I am giving mine away. Like I said it is pretty much brand new. Two of the rods have never been used. I also have the glove, the bag, the pad to set it on when it is hot and the instructions that it comes with. And these sell for $270 new. I will handle all of the shipping so you won't have to worry about that. To enter the giveaway all you have to do is leave a comment on todays blog post and be following me on Instagram. In the comment on this post you must include your full name, your Instagram handle (so I can make sure you are following) and your email address. The giveaway will go be open until Monday. On Monday morning I will announce the winner and send you an email letting you know you won. As soon as I here back from you I will get your information and ship out the curling wand. Love your outfits. Even when you're on mummy duties you still look chic. our little girls are the same age too! So excited about this giveaway! Thank you for doing it! Really love these outfits and the wand looks SO fab!! Would love to win!! Always love your momiforms- great inspiration! Love these outfits, love the wreath up on the front door!! I LOVE the Adidas outfit! Easy and comfortable. Love your blog and mommy style! Love love you and all of your blog posts and Insta stories!! I look forward to them everyday!! Also love you're doing this giveaway I've been eyeing the T3 for quite some time now!! Love love love the moto leggings! Love following your blog! This is so sweet of you to do for your followers! Not sure how I originally found your Instagram (before Andi was born!) but you are now one of my favorites! So sweet and down to earth which is very refreshing! I read your blog daily and love your style! I absolutely love love love your posts!! You and your family are just adorable and I am obsessed with your style! 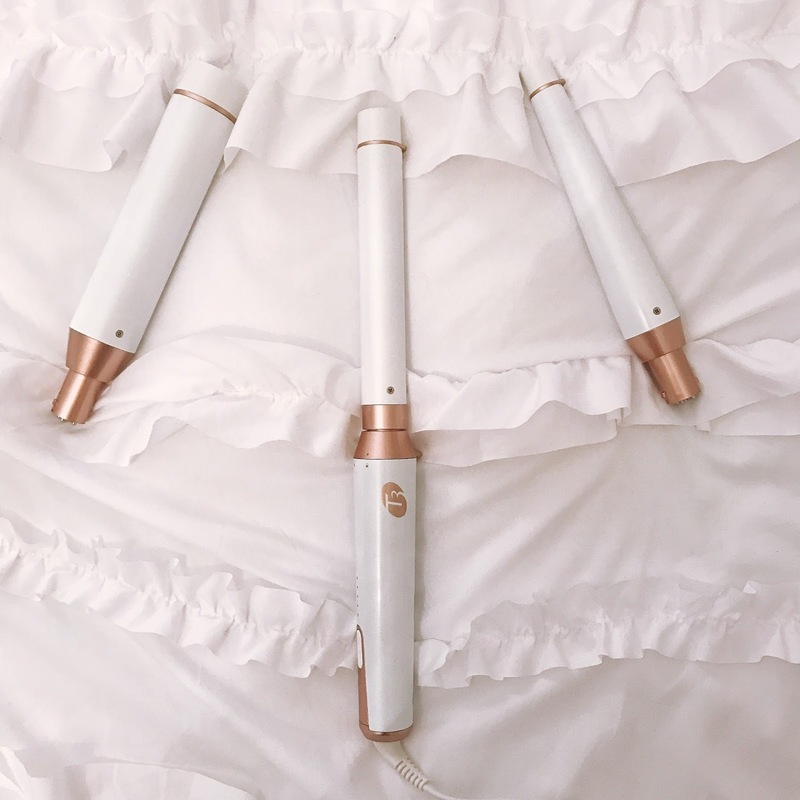 I think it is just so wonderful that you are doing this as a giveaway for all your followers, as I know it would be so easy for you to sell this expensive curling wand! I always look forward to your FB & Instagram posts. Love your style! Absolutely love your blog and your insta stories! You have the best style and are so sweet to do a giveaway!! Love following your Instagram posts & reading your blog! Absolutely love your style & your posts. FUN!! Instagram roundups are always one of my favorites! Thanks for being a doll and doing a give away! Yay! Love this! You have amazing style and I love seeing your blog posts! I know on insta stories you talked about doing a post for your followers to get to know you and I love that idea! Love your style, Jade! And so excited for this giveaway! I've been following you on Instagram since you were pregnant with baby Andi. I love your posts. I love everything you style! Beautiful! I see so many people talking about this! I love your roundups! I have been eyeing that curling wand forever! Thanks love the Andi posts lately. She's so cute! My hair could use this! Love following your account and kids. Andi and Lincoln are to die for! Great giveaway! And I love your style! Love your style so much!! Thanks for sharing!! Love these posts! Such a fun giveaway too! I curl my hair almost everyday and have wanted to try this wand but hesitant to spend the money. If you have any cute (if that exists haha) maternity clothes shopping suggestions, I would love the insight! I have a daughter who is Andi's age and baby girl #2 due in November! Love ur style!! I definitely need to invest in those Alo leggings!! They look so chic for just a comfy causal look-- totally a chic go to mom style!! I love all of your give aways and advice on fashion!! Has helped me a lot since having my son! Thank you! Thanks for a great giveaway! I need to look into those j. Crew tops as they look really comfortable! Love your style! I'm in a hair rut and would love to try a new tool! Thanks for the giveaway opportunity! Love love love love you! I love your kids they are so cute! I hope to be as cute of a mom and you are! I am so in love with this curling wand! I want one but being a 21 year old college student this doesnt go with that budget! Thanks for sharing your awesome style! Love following you. I have been following along since you were pregnant with Andi, I was pregnant then too and love your style and maternity style!! your kids are precious!! Yay!! Have been wanting one of these forever! Thanks for the giveaway! Love seeing all of your style inspirations. So sweet of you to pass along!! Fingers crossed! I so love all of your blog and Instagram posts. What a cool giveaway opportunity - thank you! Hi Jade! I have been following your blog for years! I love your style and how down to earth you are! Thanks for doing this giveaway & always creating great content! I'm a new(ish) follower and loving your blog and Instagram account! Love your style and getting a glimpse of your precious family! I absolutely love your blog and instagram page! Thank you for sharing your outfits and being style inspiration to many! I've been wanting the T3 curling wand for so long!! You are too sweet to give it away! I love your blog posts and following along on social media! Thank you for being so kind! Those pictures of Andi you posted yesterday are to die for! So so cute!!! Love all of these pictures!! I love the color of that first top! Too cute! Love your style. I started following you on the bloglovin app, pre IG!! I have been thinking about trying this styling wand for awhile now. Thanks for sharing!! LOVE all your outfits and your family is so adorable! And I've been wanting to try out this wand for forever so thanks for doing a giveaway! 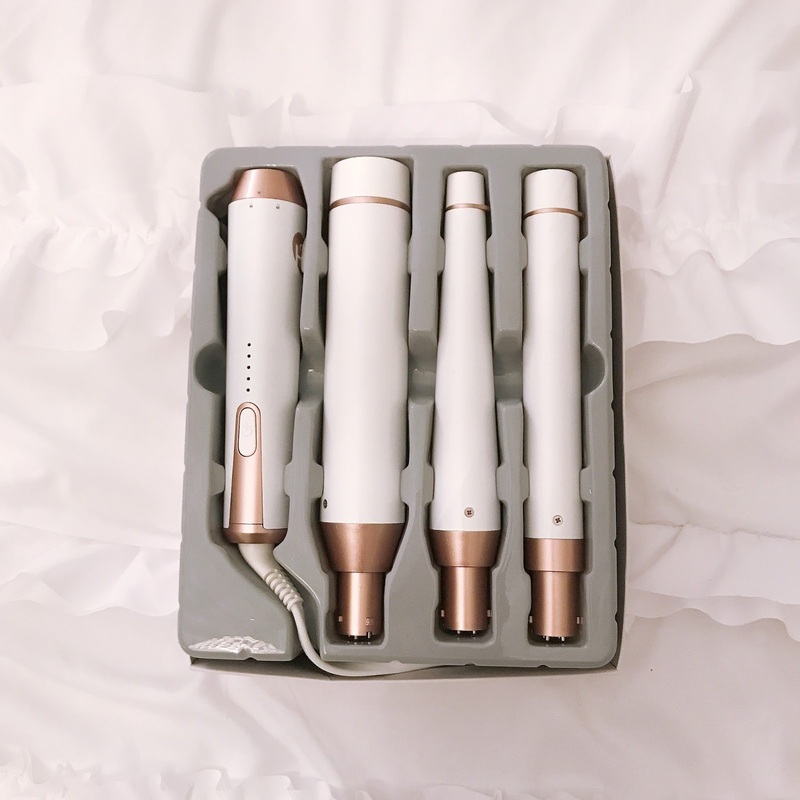 AHH I've been dreaming of this curling iron, so sweet of you to do a giveaway! And I just love all of these outfits! It is so sweet of you to be giving it away! I've been wanting to try it forever! You are so amazing! I love all of your outfits and how you dress your daughter, sooo cute! Love seeing your daily Instagram posts! Love love love you ❤️ My co-worker and I were psyched you answered our question when you and your husband did the IG live together. She asked if you missed being a hairdresser ( which we are) and you said no it's so hard on the body, we feel that!!! Would love to try this on myself/clients. I have seriously bought so many things because you have shown them on your instagram!! Love your blog and style! Thanks for the giveaway! I have been eyeballing this wand!!! So sweet of you to be doing a giveaway. So nice of you to do a giveaway! Love your style. So nice of you to do this giveaway. Would loveeee to own a T3! Have always loved following you💕 Thank you for this amazing giveaway!! From a new mama, so glad I found your blog! Thanks for hosting another giveaway! Thank you for doing this giveaway! so fun & have a good trip! I'm also just as obsessed with the Lush tees!! I need to get more! You have the most giveaways out of all the bloggers I follow!! So fun! Amazing giveaway! Thank you so much!! Yay a giveaway! I've been following you for years and it's been so fun to watch you become a mother, and to see your cute kiddos grow! I love your IG stories, and I was so excited when I saw you were giving away a T3 wand! I just love your littles! Andi is too stinking cute! Thanks for doing this giveaway! All of these outfits are so great. I love your style so much and get so much inspiration from your blog and instagram. Thank you for doing the giveaway. Keep posting, I love your insta-stories! Thank you so much for the chance to win a beautiful and much needed curling rod!! hi I love your blogs so much I've been enjoying your little princess posts I have a daughter the same age!!! Ah I've heard amazing things about this wand! Love your blog!! I have been dying to find a large wand-style curling iron! I would looove to be able to afford this one! Love all the outfits ! Love following you and your family. Our sons are close in age so I love seeing Lincoln's adorable outfits. I love following you and your sweet family! I would love to win this curling iron... thanks for the chance to win it! Your outfits are great- pieces I can use for work and weekends! Great balance. Thank you for doing what you do and inspiring others! I hope I win! Thanks for doing the giveaway! What a great giveaway. 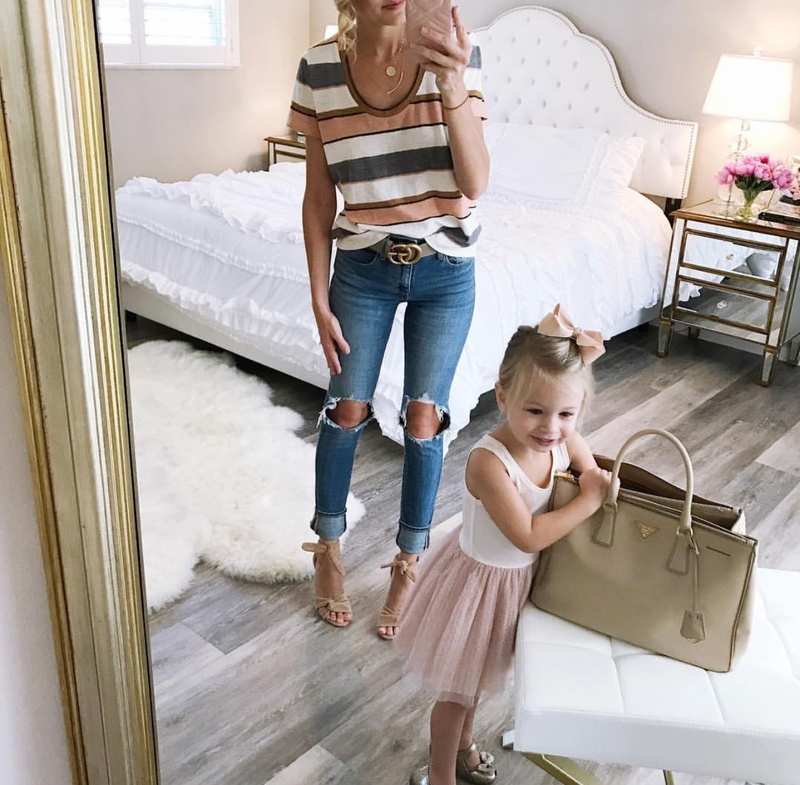 Your style is the perfect combination of well put together, but also practical for being with your young children (who are adorable by the way. Andi's dance moves crack me up..ha). Love following along, what a fun giveaway! Love your blog and insta.... I especially love your insta stories! Love the Free People bralette--just ordered two! Love your blog and ista.....thank you for the giveaway! Love your style! So glad you are doing more blog posts lately. Your hair always looks flawless! I would love trying these curls on my hair! Love your blog and Insta !! I would love to win the curling iron :) Thanks for doing this, really generous ! Love those black earrings, and well-basically everything!! Your hair always looks flawless, id love to give it a shot with my own t3!